This post aims to provide an impression of the traditions associated with Omihachiman’s Sagicho Matsuri by drawing on themes which emerge from the image above. It will look at how the floats are constructed and examine the participation of children in what is widely regarded as one of Japan’s most dangerous matsuri. Ultimately, all of the floats assembled, paraded and fought with by the people of Omihachiman succumb to the flames and fervour of the festival when darkness falls on the final day. 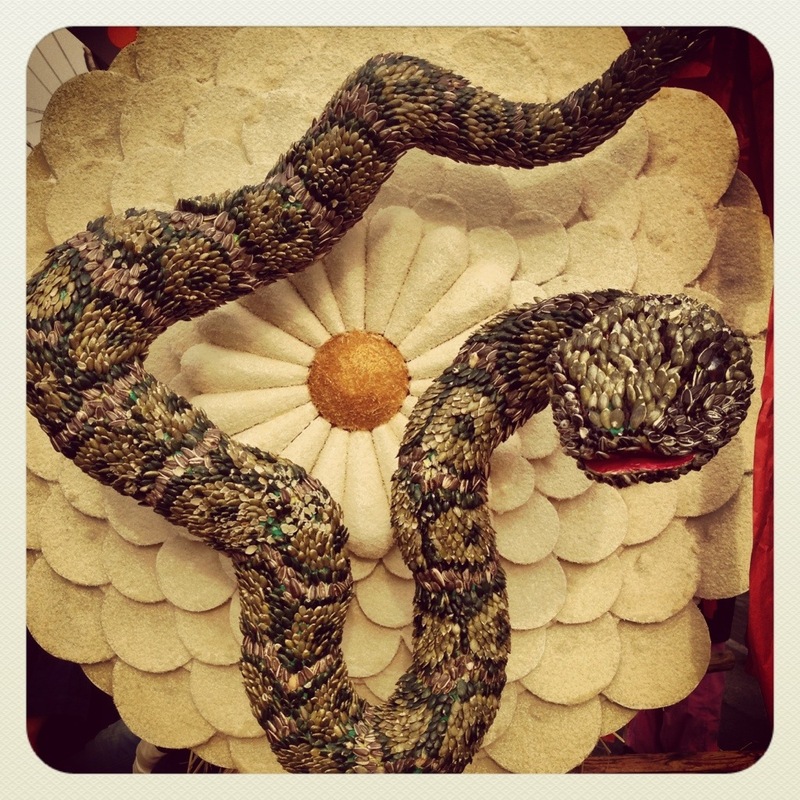 This photograph was taken at Sagicho Matsuri on March 17th 2013, the year of the snake. This zodiac symbol adorned one of the festival’s smaller floats, which are assembled and carried by elementary school students. Throughout the area children can be seen standing proudly by their floats complete with brightly coloured hair and makeup for the occasion, homage to flamboyant warlord Oda Nobunaga who wore make-up and danced while enjoying the new year’s festivities at Azuchi in the 16th century. Nobunaga’s followers are said to have established Omihachiman’s Sagicho Matsuri following their move from Azuchi to Hachimanyama Castle. The snake, above, was painstakingly decorated with beans and seeds to create a lifelike texture and colouration. It is suspended in front of a floral-design backdrop. The thirteen neighbourhoods of the old castle town spend the long winter months designing and constructing zodiac themed floats. These designs are judged on the first day of the festival, flags are displayed proudly on the floats denoting how highly each effort ranks. Designers must consider both aesthetic and structural factors. During the fighting teams attempt to flip their rivals, so what is produced must be strong, sturdy and well weighted but also light enough for the people of the neighbourhood to carry it on their shoulders. Groups with fewer members tend to focus on smaller more aesthetic floats as a result. 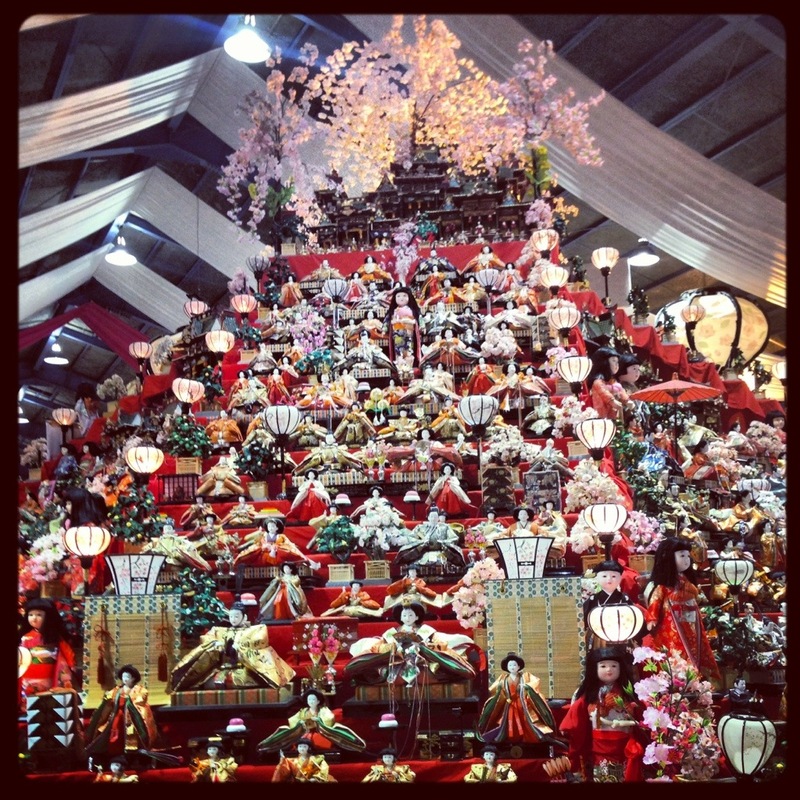 Each float is required to include a two metre high tower woven from fresh straw and, a long bamboo pole decorated with strips of red paper and tokens of good luck. In total, these structures can weigh over a tonne. The year’s zodiac animal, which is mounted on the centre of the float, must be made from marine or agricultural produce in the hope of a fruitful harvest for the coming year – common materials include dried fish, kelp and tapioca. The children of each neighbourhood are responsible for decorating their own small floats to be carried alongside the main one. By involving children in the construction process from an early age, techniques and commitment to this local culture can be passed from generation to generation. The children of the town are allowed to fully participate despite the obvious dangers. As the festival draws to a close, a mock fight is staged between the main float and the children’s float. The children theatrically come out on top against the exhausted adults and they celebrate their victory raucously. This event was described as “conditioning” by a festival veteran as the way of the matsuri becomes engrained in the child’s mindset. By the time they reach junior high school children can be seen competing with adults on the main floats, boys as young as thirteen hang from the top of the floats as they attempt to gain leverage over their rival. As the floats fall the danger of injury is very real, blood can be seen running down the faces of competitors, some are even carried away on stretchers. Alcohol flows freely and tensions run high, fights often break out between competing groups. To the foreign observer it would seem that this is not a place for children. As night falls, men, women and children dance around the burning pyre in celebration, beating the zodiac symbol with bundles of straw. It is said that after The Great East Japan Earthquake struck in March 2011 the rabbit received a particularly vigorous beating for the misfortune the year had brought to the people of Japan. This shows that the participants remain acutely aware of the meaning behind the symbols of the festival and the rituals being performed. Traditional festivals appear to be thriving across Japan, supporting local economies and attracting visitors from far and wide. This suggests that the policy of involving children from the preparation process onwards has ensured tradition survives. It is common for children to be introduced to their local culture and festivals from an early age – this enables them to gain an appreciation for the unique culture of the local community and creates a desire to preserve tradition. It is common for elementary students to prepare for local festivals at school and this strengthens community spirit and a sense of local identity. The time and effort invested in preparing for and participating in Omihachiman’s Sagicho Matsuri is reflected in the euphoria generated as the festival comes to a close.